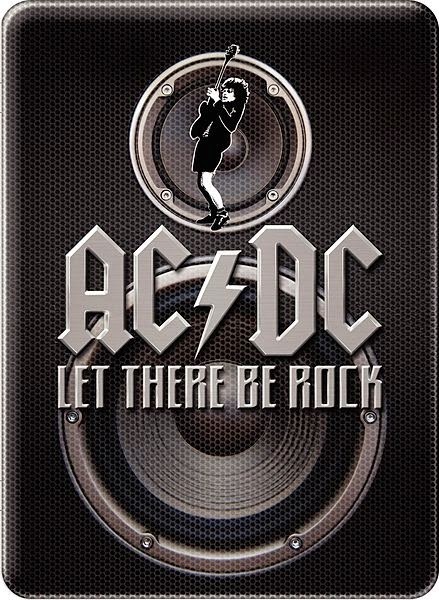 Rocktober 2, 2014 "Let There Be Rock"
"Let There Be Rock" is a song by Australian hard rock band AC/DC. It is also the title track of their Australian album Let There Be Rock, released in March 1977, and was written by Angus Young, Malcolm Young, and Bon Scott. It similarly featured on the international version of Let There Be Rock, released in October 1977.Let There Be Rock" is a play on the third verse of the Book of Genesis, in which God created heaven and earth. God's demand of "Let there be light" is echoed in the song, and is extrapolated to calls of "Let there be sound... drums... guitar... Let there be rock". In the studio recording, Scott called for sound before light, whereas this is switched during live performances of the song.The song is influenced by Chuck Berry's "Roll Over Beethoven", specifically the lyric "go tell Tchaikovsky the news", which is referenced in Scott's lyric "but Tchaikovsky had the news. ""Let There Be Rock" is a playable song in the music video game Rock Band 2. A television advertisement for the game features a Kurt Cobain look-a-like lip-syncing to a short clip of "Let There Be Rock", which resembles the music video. Others are shown playing the guitar and drum-simulating game controllers in time to the music. It was then featured on a track pack for Rock Band that have live versions of the songs in it, with Let There Be Rock being the hardest of them all, due to being played at a faster tempo than the studio version. It also is the only song with a Big Rock Ending to last more than 2 minutes. I chose this song as it was recently been announced that Malcolm Young has left the band due to his battle with dementia.